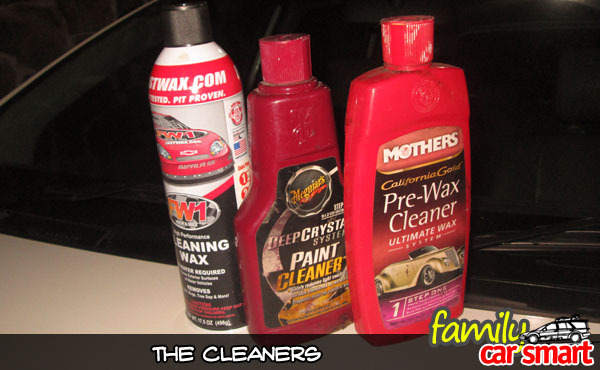 Compared Products : FW1 Cleaning Wax, Meguiar’s Paint Cleaner, Mothers Pre-Wax Cleaner. Function : Paint cleaner, cleans car surfaces from minor scratches /dirt. Quick choice : Mothers Pre-Wax Cleaner, the most aggressive of the three. Cars don’t live pampered lives on the street. We all know that it’s a jungle out there. No matter how careful we drive, our car will suffer at least some minor bumps, rubs, scratches, and other paint disturbers which will leave mars and stains on paint (or more exactly, the clear coat) surface. Many of the incidents may also occur when we are away from the car when it is parked somewhere, so it’s better to be prepared. Some of the stubborn stains, irremovable by car washing are not actually scratches. They could be paints from other vehicles, rubber marks, or other materials that stick (or pushed hardly) into the car’s clear coat layer. Even when the stain comes along with minor scratch, it can usually be cleaned, using these cleaners, especially when the damage has not gone past the clear coat layer. I used these three cleaners to clean stains left on my car’s bumper, fender, doors (you name it), the marks were almost anywhere. The blemishes and stains was caused by the car dealing with traffic packed with motorcycles and other vehicles during morning rush hour everyday. Thus my objective is to remove the stains from rubbing with rubber, other objects, and some stains left by dirty rain water /ground water. Packaging: pressurized can, 17.7 oz (496 gr). This cleaning wax promises that it is safe for clear coat, contains carnauba wax, and will leave no scratches or swirl marks. It should also lift dirt and grime and give a professional car show finish. Packaged in a pressurized spray can, it must be shaken for 10-15 seconds, sprayed to an area of about 1 square meter, wiped with a towel, and then rubbed with microfiber cloth (supplied). I consider spraying method is not a good way to apply such product. It is easily over sprayed to unwanted places (as I did). It was a messy job. And careful attention must be given when spraying near parts we don’t one to this cleaner on, such as glass or rubber. It is not a practical way to apply the product. Performance: I am somewhat disappointed. This FW1 Cleaning Wax seems to be geared more toward removing road dirt than stains caused by rubs with other objects or dirt film left caused by dirty ground water. The label says it removes tar, bugs, tree saps (which it does), and more. I found out that “more” does not mean more stubborn dirt than the three objects. Price: Got it for about Rp 200.000,- (about US$ 15) (a microfiber cloth included). Conclusion: It does what it says, just don’t expect more. Package: plastic bottle, 473 ml, 16 fl oz (US). Availability: Available at Amazon UK. US market might have a different product for similar purpose. The package label says that it will safely remove light swirls and surface blemishes, prepare paint for polish and wax. It is non-abrasive, and as addition to removing road grime, it can remove surface contamination, light oxidation, swirls and scratches and restore dull finishes. Most effective with applicator pad (using a polishing machine). The label says that it should be applied on washed and dried surface. As mentioned earlier, it is recommended to use an applicator pad such as Meguiar’s Soft Foam Pad Applicator you can get here: (Meguiars X3080 2 Count Even Coat Applicator (4 Pack) . Then it should be removed from the surface using a microfiber cloth. I used manual labor to apply it, using soft cloth. It managed to remove some of the blemishes, typically light ones resulting from rubs with motorcycles and some stain left by dirty ground water. Performance: Medium. There was a dirty spot on my car hood, that washing (and F1W1 cleaning wax) cannot remove, but this paint cleaner can eliminate. However, it required rigorous rubbing. This Meguiar’s paint cleaner did its job quite well, although I feel like that Meguiar is playing safe with this paint cleaner. They have other products with more aggressive cutting performance (which I may review later). Price: GBP 10 (from Amazon UK). Conclusion: Quite worth it if you’re looking for a capable cleaner which still lies on safe, mild cutting side. Package: plastic bottle, 473 ml, 16 fl oz (US) (same volume as the Meguiar’s paint cleaner). Available at amazon.com in the Wax Kit package. The Carnauba Wax in the package is a good product too (which we may review some time). The package label says that it prepares paint finish for polish and wax, remove oxidation and old wax, yet safe for all paints and clear coats. This is part of a 3-step process (pre-wax, sealer and glaze, carnauba wax). Hand use: the label recommends using soft tower, microfiber towel, or applicator. It must then be allowed to dry to a haze, and then removed with a terry cloth towel. Using random orbital buffer: approximately similar procedure (detail is written on label). Manual labor again as usual, using soft cloth. This is the most aggressive of the three. It removed most of the blemishes, stains the other two cleaners cannot do. Performance: Good. Cleaned almost every blemish or stain I wished to remove, except for the ones from rather deep scrape the clear coat. I am satisfied with this Mothers Pre-Wax Cleaner. One concern is that it clearly warns that it removes previous wax on the car, thus re-waxing is absolutely required. Price: USD 49.99 (in a wax package from amazon.com). Every one’s need differs. These products are the ones that I could get and tried in the effort to remove the blemishes and stains on my car. They might not be straightly comparable though. Nevertheless, I tried what I considered appropriate for my need and these were what I could get. Availability may differ to among countries. I just hope this article can be at least a little help. Thank you.